IoT, xRM and Much More! 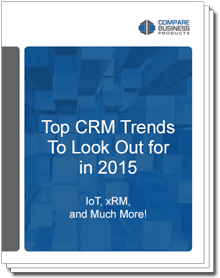 A CRM has a ROI of $5.60 for every dollar spent. Studies have shown that a CRM can boost employee productivity by 15% to 17%. Under the circumstances can you afford to overlook the major trends 2015 has in store for you? Dubbed as a ‘Coming of Age’ for many innovations like mobile CRM and xRM, 2015 will also see the first flight of the Internet of Things. This asset will tell you about the relevance of the system you have in place. So download now to gauge what your preparations need to be!